A revolution in media and marketing triggered by recent digital technologies has fundamentally changed the world. Most companies see it as a threat. You can see it as an opportunity. For the last century advertising involved a monologue. Brands spoke to consumers through mass media with powerful results. Brands also enjoyed a message monopoly. The cost and complexity of television, Radio, print, and outdoor prevented consumers from participating, but no more. Personal computers, smart phones, affordable software, social web applications, and ubiquitous broadband connections have equipped and empowered nearly everyone to take part and people are using this new-found power to express their love or loathing for brands. This groundswell of connected consumers’ represents a threat to companies entrenched in the past, but a vast resource to businesses prepared to engage them in new ways. But how? All brands exist in a Trialogue. The only choice is whether and how to participate. Those that strategically leverage it can develop more relevant brand strategies, expand their advertising impressions, better manage their image, and enhance the trustworthiness and authority of their messaging in a marketplace they no longer control. Dell discovered the need for Trialogue when, in 2005, blogger Jeff Jarvis began recounting his customer service nightmares on his BuzzMachine blog in a post titled "Dell Hell." Like a magnet, his post attracted other unhappy customers who left similarly scathing comments. Soon it was all over the web. Search "Dell" on Google at that time and "Dell Hell" was on the first page of organic results. To its credit, Dell embraced Trialogue and transformed a nightmare into a vision for the future. • It built a system for tracking online conversations involving its brand and began proactively reaching out to people with problems. • It joined the conversation by starting its own blog; winning praise from customers for authentically addressing positive and negative issues. • It launched IdeaStorm, a site where customers can suggest and prioritize ideas from new products to service improvements and Dell can report on its plans and progress. Today Dell relies on Trialogue interaction with its customers to support its rejuvenated business. Implementing Trialogue in your business involves three steps. The best brands, like best friends, are good listeners. Begin by uncovering brand conversations. The Buntin Group recently built a Brand Monitoring Dashboard for a client that monitored websites, blogs, chat rooms, forums, and even Twitter in real-time for conversations involving the client's brand or its competitor's. It tracked the volume and tone of that chatter and identified the people making those comments so the client could connect with them online. • Creating venues for brand discussions like social networks and forums. • Inviting your customers to participate in new product development and service improvements. • Designing systems that enable customers to more effectively engage with your business. ATMs and online banking are good examples from the financial services industry. • Joining the conversation by commenting on existing blogs and forums, and/or starting your own. • Reinforcing brand truths with targeted advertising through traditional channels. Equip the audience with tools that leverage its connectivity to help them share your brand message with their social network. New digital tools make this easy and affordable and can radically extend brand strategy, communications reach, and advertising impressions. A former New York Times editor recently wrote a full-page article for Forbes magazine advocating "variable pricing" for art museums. "Art institution directors should start thinking like airline yield managers," was the subhead of the article. That's strange. You might think the yield-management gurus would have the airlines rolling in dough. But that hasn't happened. Take the five largest U.S. airlines. United went bankrupt. Delta went bankrupt. Northwest went bankrupt. US Airways went bankrupt. And American Airlines is losing money. In the last 10 years, American has had revenues of $199.8 billion and managed to lose $6.7 billion. Not exactly an industry to emulate. Why do otherwise intelligent people borrow ideas and concepts from failing industries and think they will succeed in a different setting? The unfortunate answer to that question is that in today's world, ideas and concepts don't seem to matter. What matters is "execution." If you can execute well, goes the thinking, you are going to win. Which in itself is true. What is not true is that execution is unrelated to the power of the ideas and concepts driving the business. Variable pricing is one of those ideas. No matter how well you execute a variable-pricing strategy, you wind up undermining the brand. Airline customers used to be brand loyal. When I worked at General Electric in Schenectady, New York, I always called American Airlines first. If they didn't have a flight to where I wanted to go and at roughly the time I wanted to leave, I would ask the American representative to suggest another airline. Variable pricing has destroyed the bond between airline and customer. Almost nobody books a flight without first asking, "What would that cost?" Al Ries is chairman of Ries & Ries, an Atlanta-based marketing strategy firm that he runs with his daughter and partner Laura. Yesterday's brand-loyal customer is today's price-comparison shopper. Except for Southwest Airlines, of course. While the airline does use yield-management strategies, it also puts a cap on its fares so they are never out of line. According to a recent survey of the American Customer Satisfaction Index, Southwest came out on top of the airline category for the 16th year in a row with a score of 81 out of 100, its highest ever, compared to a score of 64 for the airline business in general. The major airlines should hold their heads in shame. It's like Wal-Mart coming out first in customer satisfaction ahead of Nordstrom and Neiman Marcus. High prices alone are not the problem. Often you need a high price to define your brand. Without its high prices, Rolex would be just another watch brand. And Porsche would be just another sports car brand. It's the variable pricing that causes the problems. You can see a mini version of this effect in the cola aisles of many supermarkets. In my local supermarket, for example, you normally see both Coca-Cola and Pepsi-Cola priced at $4.69 for a 12 pack. But often one or the other brand is on sale for $3 for the 12-can package. With this much disparity in price, many consumers automatically buy the one that's on sale. In other words, the brands don't matter anymore. What matters is the price. Years ago the Coca-Cola Co. began testing a vending machine that could automatically raise prices for its drinks in hot weather. Consumer reaction was immediate and caustic. One beverage executive said, "What's next? A machine that X-rays people's pockets to find out how much change they have and raises the price accordingly?" Brands have a function to perform, and one of the most important functions they perform is communicating the brand's price level and its equivalent quality level. Consumers equate quality with price. The higher the price, the higher the quality. Not that consumers always want to buy the highest-quality products. Often they would rather save money and buy something less than the best. These decisions usually depend on the category. Some categories are more important to a consumer; some categories less important. Some consumers buy expensive watches and cheap toilet paper. Or vice versa. There's nothing wrong with being a high-end brand. There's nothing wrong with being a low-end brand. There's something wrong when you try to be both. Take Lenovo, for example. What's a Lenovo? Is it a high-end computer or a low-end computer. Actually it's that and a midprice computer, too. Lenovo has three lines of laptops. The ThinkPad line is at the high end. The "value line" is at the low end, and the IdeaPad line is somewhere in between. Prices in America range from $349 to $1,999. Lenovo, like many companies around the world, is trying to increase sales by appealing to everybody. That seldom works. Lenovo is suffering. After eight years of profitable sales, the company lost $226 million in its last fiscal year. Out went Lenovo's American chief executive, replaced by his Chinese predecessor. That sort of strategy is one of the reasons the U.S. automobile industry is in trouble. Trying to cover a wide swath of the market with a single brand name. I remember a Dodge executive, years ago, bragging about the fact that the Dodge brand covered "85 percent of the market." Is that good? It doesn't seem to be since Dodge is currently in the Dumpster along with the rest of the Chrysler brands. The problem is, most people do this all wrong. your house payments or whatever. going to make anyone do anything. whatever current event you're mentioning. Got a difficult question? Just ask me, baby! "Many marketers like to blame their lack of innovation on their lawyers," says Rohit Bhargava in a post at the Influential Marketing Blog. They're an easy target, he notes, because the more groundbreaking a marketing concept, the more likely it is that a lawyer will tell you why it can't be done. "[B]ut remember," he adds, "their job isn't to help you sell more stuff or engage your customers. Their job is to minimize risk." In other words, they're not trying to sabotage your creativity—they're trying to anticipate and prevent unintended negative consequences. So stop thinking of lawyers as an obstacle; instead, make them your partners by showing them why they should say yes. "There is one thing that every lawyer needs in order to make any kind of argument," he says: "[A] precedent." Bhargava points to a user-generated PSA contest run by the Environmental Protection Agency. When it ran into potential legal issues over public funding of a $2,500 grand prize, its promoters cited the precedent of a 1927 contest in which the winning design, for the Memorial Bridge in Washington DC, received prize money from the public coffers. Problem solved. When asking open-ended questions, simply ask: Who, how, what and why. Do not say: "May I ask you a question?" This question gives up your control of the conversation. With this question, you are asking permission. You don't need permission to ask questions. CHICAGO (AdAge.com) -- Starbucks chief marketer Terry Davenport has a big job these days. The embattled coffee chain is looking for ways to offer value without discounts that would degrade the brand and market without pandering, all while fighting off the onslaught that is McDonald's McCafe. Mr. Davenport, a former KFC marketer, joined Starbucks in 2006. Several promotions culminated in his scoring the CMO spot about a year ago. Since then, he points to a few recent successes, including solid sales of the company's loyalty cards, a strong response to its get-out-the-vote offer and encouraging results for Via instant coffee. But many hurdles lie ahead. 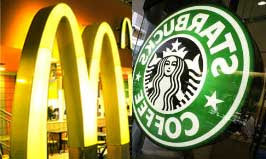 The chain has been posting negative same-store sales for over a year, and many analysts expect McDonald's initial McCafe push, which began last month, to significantly dent Starbucks sales, if only initially. In the most recent quarter, Starbucks reported same-store sales down 8% and earnings down 77%, primarily due to restructuring charges. Still, thanks to a strong, year-old relationship with its agency, BBDO New York, Starbucks is more visible than ever while keeping marketing spending relatively constant. According to TNS Media Intelligence, Starbucks spent about $28 million in measured media during 2008. It began its first concerted branding campaign last month, with a series of newspaper ads. The work makes Starbucks' case for its prices, including health care for its employees, relationships with coffee farmers and its dedication to sustainability. Starbucks also now runs one-time TV ads in high-profile shows such as "Saturday Night Live," or quick hits on news networks such as CNN, which then drive traffic online. The marketer made more waves this week with the sponsorship of MSNBC morning news program "Morning Joe." A natural partnership, Mr. Davenport said, it will include occasional references to the chain's environmental activism or efforts in volunteerism. Mr. Davenport, 51, reports to Michelle Gas, exec VP-marketing and category, and also works closely with CEO Howard Schultz, a man he describes as one of the most respected marketing minds in the business, and someone who rolls up his sleeves and gets involved in messaging. In an interview with Ad Age, Mr. Davenport explained why McCafe will be good for Starbucks, because the Golden Arches are paying to educate the mass market in a way Starbucks has never been able to. Ad Age: Starbucks is facing attacks on a variety of fronts, from fast-food companies with enormous ad budgets, to superpremium local and regional coffee chains that are quicker and nimbler. What about that is most troubling? Mr. Davenport: The obvious brand-guy answer is that we absolutely will not allow ourselves to be squeezed into the middle of those two groups. On the mass side, we know from research over the years that there are still a lot of people who drink coffee every day but don't understand the difference between a cappuccino, a mocha and a latte. But we never had hundreds of millions of dollars to do that education. The fact that there are people spending money and having that conversation, we think it will benefit the entire category, and we'll get our fair share. If people get into the category, get comfortable and want to trade up to a premium, higher-quality version, we're in a great position to capture some of those. Ad Age: How has your strategy changed during the recession? Mr. Davenport: Early on, we got to a point of view that this is not just some temporary speed bump we have to manage through, but a seismic shift that has happened in consumer consciousness, and consumer spending habits aren't just going to return to what they once were. And as to how Starbucks and "your Starbucks occasion" stays relevant to that consumer mind-set, there are two things: the emotional part to our brand that's bigger than just that cup of coffee -- it's an emotional connection -- and now more than ever it's that sense of community, something in life can connect you to something larger. Ad Age: How are you measuring ROI these days? Mr. Davenport: We're probably more focused than ever on store-level transactions and the number of people who walk into every store every day. Probably more than ever we're focused on what it takes to bring people into our stores and keep their frequency at a time when they're having to make some tough budgeting choices. Ad Age: Are you involved with pricing decisions? Mr. Davenport: Pricing decisions are very much a part of the marketing mix. We're aware that now more than ever pricing can't be a blunt instrument, and as you look at pricing, it's got to be in the consumer construct. You'll probably continue to see us do in-store tests of a lot of ways to bring value to core customers. Ad Age: Starbucks began its first true branding campaign last month. Why did you choose newspapers? Mr. Davenport: We started working with BBDO in October or November of last year, and one of the things on our joint to-do list was to find a way to get our stories out there in a way that both our existing customers would recognize and that would speak to the employees and partners and give them a sense of pride, and that's clearly happened. We're exceedingly pleased with it to date. If you're going to look at a quick ROI, and if one of the ways you gauge that is the visibility and kind of talk it's getting. ... We've had a huge return on that investment. Ad Age: You managed to launch a major campaign just days before McDonald's McCafé blitz began. Was that planned? Mr. Davenport: We didn't move it up or back based on anybody else's schedule. It's about coffee, and launching in the middle of the summer wouldn't have been the right time. Before the weather turned hot we feel like we got it out there in the right time, and we felt really comfortable with it. Ad Age: How do online communities, and the energy around the Starbucks brand, affect your media and marketing plans? Mr. Davenport: Starbucks is not just a product, it is an idea. The idea is that sense of community and conversation that can happen over a great cup of coffee. That's why our brand has such relevance in that space. Customers and employees are looking for the truth behind what their company stands for and want to get behind brands that share certain values. When we go out and have good traction with Facebook, it's because of those types of messages. Ad Age: Can you give an example? Mr. Davenport: Take how we communicate our value-pairing message. It's very important to our value strategy. It's been very successful at the store level, but that's why we communicate that at the store level. A tie-in with Facebook on value pairings isn't something you're necessarily going to run out and share with your friends. But learning that Starbucks has a tie-in with Red and that on World AIDS Day we'll contribute a nickel for every beverage we sell -- for people in the Red community, that's big news, and they'll pass it on to their friends. Ad Age: How's it going with the new agency? Mr. Davenport: We work exceedingly closely with BBDO and in a very short time feel like we're all part of one team, and that includes Howard. Howard and Michelle are very involved with formation of strategy, down to getting our voice correct, and in this day and age, you need an agency that's willing to roll up their sleeves and get involved with you and learn about your brand and bring creative solutions that are brand-appropriate. Killer chinchillas. Drink Dr Pepper slow and Corona on the beach. Let's launch! The new iPhone records video. It has other new features, but video is the key function highlighted in "Break In," launching June 15. The ad broke Monday online at Apple.com. The iPhone is kept under tight wraps at the Apple lab. Not so tight, as a cat burglar drops down a small video camera to snap shots of the device from all angles. "I think it's the same," he tells his accomplice. An Apple employee enters the vault, picks up the iPhone and replays video of the rogue camera sizing up the iPhone. The employee doesn't look the least bit unnerved; he merely glances at the ceiling. See the ad here. TBWA/Media Arts Lab created the campaign and handled the media buy. Happy ChinChilli Day. The next time you need a three-day weekend in Vegas, use ChinChilli day as an excuse. The Las Vegas Convention and Visitors Authority launched an interesting TV spot showcasing an employee's impressive knack for storytelling and weasling his way into a three-day weekend. The man regales his boss with the story of the chinchilla revolution, when pet chinchillas revolted against their owners, using shotguns, bites to the jugular and dynamite. The humans defeated the chinchillas -- and what better way to celebrate than a long weekend in Vegas? Watch the ad here, created by R&R Partners. Dunkin' Donuts launched a TV, radio and outdoor campaign introducing consumers to the Wake-up Wrap, a breakfast tortilla that costs 99 cents. Each wrap contains a ½ scrambled egg and a slice of American cheese. A slice of cherrywood smoked bacon can be added for 50 cents. The campaign uses the tag line, "Breakfast NOT Brokefast." My wallet might be heavy, but my stomach would be empty. I'd probably need four of these to quiet the rumbling. The TV spot shows a woman conversing with her co-worker on the elevator ride up to work. She's carrying her iced coffee and wake-up wrap, which he's ogling. He also has a waist that Scarlett O'Hara would envy, because he's physically tightening his belt in order to save money. See the ad here. Consumers attempt to save money by pushing their cars to work and paying a lesser fee for a toll ride in radio ads, heard here and here. In addition, if you live in New York, Chicago or Boston, be on the lookout for strange displays in public fountains. Khaki-clad legs are sticking out of the water next to a sign that reads: "Please Do Not Remove Change for 99¢ Breakfast Items at Dunkin' Donuts." See it here. Hill Holliday created the campaign and handled the media buy. Grocery shoppers needn't hunt for great prices if they shop at Food Lion. Elsewhere, it's a jungle. A group of differently priced shopping carts roam the jungle in the first ad. A family sets their sights on the cart within their budget and hunts it down. Watch the ad here. Cheddar cheese is the missing item, still to be checked off a grocery list, in the second ad. A piece of cheedar is spotted -- on sale -- and a bargain-happy family quickly surrounds it. See the ad here. Ames Scullin O'Haire created the campaign and handled the media buy. Wawa's Hoagiefest began June 1. Now in its second year, Hoagiefest is a summer-long celebration of Wawa hoagies. Creative has a '60s vibe. Check out this beachy, psychedelic spot promoting Wawa's Italian shorti. There's also a microsite where users can upload a video to be played along with an existing Hoagiefest song, create an original song or create both an original song and video. There will be a winner for each category. The existing songs are cheesy funny. They're worth a visit to the site. The Richards Group created the radio, television and print elements and The Archer Group handled the online components. Dr Dre plays a better fake doctor than Gene Simmons, aka Dr Love, in the latest ad for Dr Pepper. Dre shows up at a party where the DJ is spinning fast-paced techno music. The rapper takes over for the DJ and plays a slowed-down version of a song off his upcoming album. And he's wearing his own Dr Dre brand of headphones in the spot. Who got the better deal from this collaboration? The spot ends with "Trust me. I'm a doctor," the campaign's tag line. See the ad here, created by Deutsch LA. Corona ads make me happy that summer is just around the corner. Two refreshed spots launched June 8 on network and cable TV. The headlines of a newspaper's financial section are shown in "Kite." As the camera pans out, viewers realize the paper has been crafted into a kite, being helmed by a couple drinking Coronas on the beach. Watch the ad here. A man is skimming rocks into a crystal-clear ocean in "Lagoon." His BlackBerry starts to vibrate the same time he's about to skim another rock. You know what happens. The Blackberry sleeps with the fishes. See the ad here. 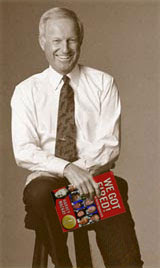 Cramer-Krasselt created the campaign and handled the media buy. For nearly a month, I've been publishing this list of selling tips from Mr. Harvey Mackay, adding one tip each day. Today we are at the end of the alphabet and so if you are looking for the complete article, here it is. Customers aren't always right, but if you want to keep them as your customers, find a way to make them right. Education is for life—never stop learning. Listen to your customers or they'll start talking to someone else. Service is spelled "serve us" in companies that want to stay in business for a long time. Volunteer: It's always good to give back. You'll probably find that you get more than you give, and there is no shortage of organizations that need your help. Winning doesn't necessarily mean beating everyone else. A win-win situation is the best of both worlds. X-ray and catscan your customers so that you know everything about them—so you can serve them better. You is a word your customers need to hear often, as in "What can I do for you?" Some things never change—including the importance of knowing how to treat your customers and what really matters in your relationships. And as you can see, most of these items cover far more than just sales. Mackay's Moral: Now you know my ABCs—sales skills from A to Z. To Tweet, or Not to Tweet..
During a late lunch (for me) or an early dinner (for my wife's grandparents) at Applebee's in Reading, Pa., I was distracted from figuring out how to eat my riblets when I heard the conversation inevitably turn to Twitter. It wasn't the most senior members at the table who were interested in tweeting -- thank goodness, as that would have made me fall off my chair faster than an Applebee's Top Shelf Long Island Iced Tea. Instead, my uncle, an optometrist, had been hearing about Twitter and wondered if he should tweet professionally. When I answered Uncle Glenn, I brought up a number of factors that he should consider when evaluating the service. I also compared his situation to that of Jeff, my father-in-law, a plastic surgeon in Dallas. Glenn and Jeff have several things in common: small businesses in healthcare targeting older-skewing customers who aren't particularly tech-savvy. There are key differences though, and those are described below. Domain squatting: Is there any value for you to register your business name or even real name (if you own your business or are the face of it) as a Twitter user name? I covered this recently, and there are a number of reasons why you should, even if you don't plan to actively use it. Brand mentions: Is anyone talking about your actual business already? For a small business, this isn't as likely, but you absolutely must check. For this search and others discussed here, use Twitter Search at search.twitter.com. While Twitter offers search functionality on its own site, it's only available to registered users, and Twitter Search is more robust. Topical mentions: Are people on Twitter discussing topics relevant to your business? For Glenn, this might mean posts about getting glasses. For Jeff, it might be concerns about aging, or about certain products like Botox. These signal opportunities where you can respond and be a resource. I once tweeted about a friend needing a WordPress programmer; the person who responded wasn't following me but was getting alerts for relevant terms, and he wound up with the gig. Location mentions: If your business is based in or focused on a certain city or region, search Twitter to see what people are saying about it. Then use the advanced search feature to find posts from people based within a certain area. There may be ways to be a resource about your area. You should also run location-specific searches for your brands and relevant topics. The potential reach also matters; Glenn's target is residents within a small radius of Reading (population: 83,000), while Jeff's customers live in and beyond the Dallas/Fort Worth Metroplex, home to one-quarter of all Texans. Target audience: If there are lots of relevant mentions, click the user names to see if they look like they could be in your target audience. If the volume of tweets is high enough, you'll find a sample of people who are sharing information about themselves, whether from their Twitter profiles, the links to their sites, or what they're talking about. Competitiveness: How cutthroat is your business? Do you need to do anything and everything to stay ahead? Twitter could be a competitive advantage, or a necessary defensive strategy. Jeff's business is one of those fields where his competitors will shamelessly copy whatever he does, from marketing to innovative surgical procedures and technologies. Glenn's field is toward the other end of the spectrum, where he spends a lot of his time sharing what he knows with his peers. Someone like Jeff is thus more inclined to use Twitter because they have to, while someone in Glenn's situation would use it if they want to. Sales cycle complexity: How involved is the purchase decision? For Jeff's business, there's a lot of complexity in terms of understanding the procedures and technologies involved. Plus, if anything goes wrong, it will often be very visible to everyone the customer knows. This means Jeff must invest a great deal of energy in making prospective customers feel comfortable with him and his business. With Glenn, trust is no less important, but his customers don't need to conduct as much research online; he'll wind up earning most customers' trust in person. Purchase frequency: This can vary considerably for both Glenn and Jeff. For Jeff, many customers need to return regularly for maintenance. Glenn, meanwhile, has an opportunity to provide services for the whole family, from eye exams to glasses. How valuable is it to stay top of mind? Acquisition vs. retention: If most of your business comes from existing customers, then just ask them if they use Twitter and if they'd want to keep in touch with you that way. If you're continually prospecting, then you need to review these other factors. Bandwidth and resources: Even if your target audience is on Twitter and there are a million reasons to connect with customers there, do you work with anyone who understands Twitter well enough to participate, or can you afford to pay someone else to train you or run your Twitter program? That's the long answer. The short answer is, "Are your target customers on Twitter, and do you have the resources to reach them?" Jeff gave these factors a lot of thought and is already tweeting away, even if he's still figuring out the best way to use it (like most everyone else). Glenn will probably hold off unless his Twitter research uncovers surprising results. Both can periodically return to this guide to assess whether Twitter has the potential to help them grow their businesses. Even if it's a little challenging to understand, it's all much easier than figuring out how to eat a riblet. Recently I touched on this subject. Click here to read what I wrote. Holly Buchanan opens a post at the FutureNow blog with a pair of seemingly contradictory ideas: that testimonials work very well and that they don't work at all. Both are true, she argues, because customer praise can be a two-edged sword: If it appears inauthentic or doesn't offer true insight, it can actually have a negative impact. Are specific in their commendation. A generic testimonial like "I enjoyed my time at your hotel" won't grab the attention of a business traveler in the same way as, "I was impressed by the 24-hour concierge service, especially when they found an all-night printer at 3 am." Address possible objections. You gain credibility when a happy customer explains how her initial skepticism was unfounded. "[B]y addressing and voicing what many perspective [sic] customers may be feeling," says Buchanan, "these testimonials are powerful persuaders." Are shown in a proper context. The testimonials on your website's landing page, for instance, will be different from those on product pages or order forms; each should be appropriate for where a customer might be in the sales process. The Po!nt: Not all testimonials are created equal. "Testimonials hurt you when people don't think they're real," says Buchanan. "Anything that sounds vague or cliché can smack of insincerity." Source: FutureNow. Click here for the full post. Think of all the time you have put in and the energy you’ve exhausted on attempts to cajole client contacts who love to say “no” but can’t really say “yes.” It can be a frustrating, morale-beating process. It also happens to be bad for your business’ bottom line. Making a connection with the buyer, the individual who can say “yes,” isn’t always easy. Aim low or aim high and, well, you know what you get. 1. See yourself as a peer. Before we get into approach, answer this: Are you confident enough to dialogue on equal ground with the big wheels who run the show? You would be shocked at the number of grown adults who will answer this with a “yes” to others, but say “no” to themselves in subtle, counterproductive ways. Trigger Tip: To view yourself as a peer, use positive self-talk and manage that internal cynic. Remember, how you present yourself is stronger than any service or product you offer. A strong handshake, a confident personality and voice, and the right mental attitude can make a huge difference. A lack of preparation may be the biggest deal killer there is. When it comes to connecting with buyers, you must know three areas – and know them well. This includes: Their company. Their competition. Your product or service. Do these seem like no-brainers? You’d be surprised how many service providers don’t know when a company was founded, what their mission statement says, who their biggest clients are or how they fare against the competition. As far as knowing your own product and service, read on. Trigger Tip: If you haven’t made Google your best buddy, start today. It will swiftly allow you to collect information about the companies you target, and often the professional resumes and personal interests of your buyers. 3. Speak in sound bites. When you have the chance to speak to the buyer, get to the point and remember that less is more. Too many service providers ramble on aimlessly about what they’re selling and can kill their credibility because of the confusion they create about their product or service. Decision-makers want you to be brief. Granted, when you get those few moments to audition, it can feel like a pressure cooker. So, prepare ONLY information that demonstrates how buyers will benefit and what their return on investment will be. If you don’t have this ready to be delivered in 15 seconds or less, practice. Trigger Tip: For every piece of information about your service or company you prepare, ask the questions that your buyer would ask, such as: “So what? or “What’s in it for me?” These force you to always speak in benefits-focused, buyer-friendly language. Trigger Tip: Be sure your questions are open-ended, (which allow buyers to elaborate), and make certain they tie directly into the objectives the buyer has and how they will know when successful results are realized. When trying to impress a buyer, it’s easy to try too hard. We’ve all done it, but it’s crucial to be yourself. If you disagree with something he or she says, tactfully push back and challenge them. Authentic candor has elevated many sales people from yes-(wo)man status who don’t get the business to peer status who get the “yes” simply by serving as counsel a buyer can trust and respect. Trigger Tip: Don’t try to be too enthused or eager right away. Think about how turned off you get when a telemarketer tries to impress you with glib, cheesey-speak. You want to run the other way. Be genuine and be honest at all times. High-level clients are usually a tougher sale. They require an eclectic approach of preparation, self-talk and smart behaviors. But the common ground is when you are able to make that connection and get the right answer from the person in charge that yes, means yes! Back home after a 7 day 2000 mile drive. So we're back to nightly Marketing News updates from Mediapost. Read and click! There are multiple sides and websites representing ScLoHo. ScLoHo was founded by Scott Howard is a mashup of his first, middle and last names. 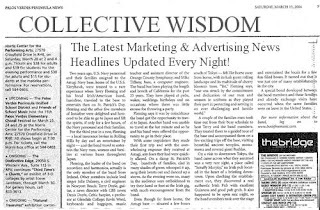 ScLoHo's Collective Wisdom shares some of the best Wisdom and Information related to Sales, Advertising, Marketing and Media from dozens of sources. The Not-So-Secret Writings of ScLoHo, are strictly the words of ScLoHo on the subjects of related to Sales, Advertising, Marketing and Media. ScLoHo's Really? is a more personal site that also include a Fort Wayne site of the day to promote his home town. ScLoHo's Social Media Adventure is devoted to introducing you to various social media tools and tips. Scott Howard has been in this field since his days in Detroit in the late 1980's and invites you to explore all of ScLoHo. News, Insight, Research and Training on the Subject of Advertising, Media, Marketing, and Sales. It's a collection from many experts, writers, and gurus, updated at least 3 times daily. Each morning, we start with sales training wisdom (at or before 6am Eastern time).